Well, it was a happy one for me this morning as I was woken up by the postman with a little special delivery from NET-A-PORTER...Yay! I've seen so many of these novelty Moschino phone covers in the press since Jeremy Scott debuted the now infamous, trademark French Fries case in his Fall 2014 collection. 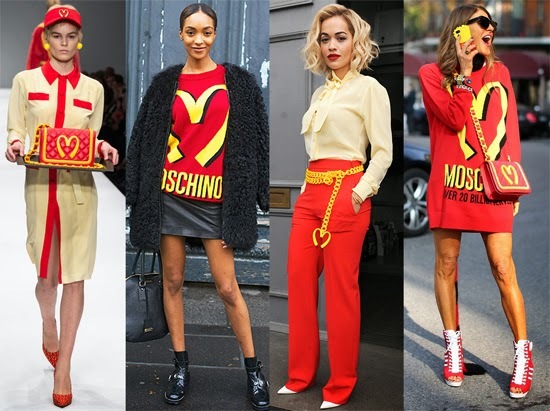 He cleverly used the McDonalds golden arches to portray the Moschino 'M' which is demonstrative of his quirky, fun style. Other brands, like Marc Jacobs and Givenchy, have been quick to jump on the bandwagon and now there are a plethora of novelty cases out there. I do like Givenchy's rottweiler and Bambi designs although for me the Moschino collection, which has developed a cult following, is still my favourite. 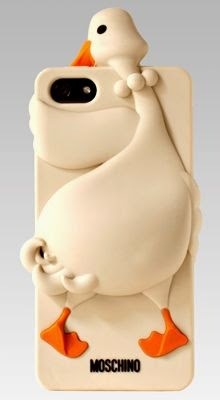 I also like the Luisa goose cover (below), although this one is sold out almost everywhere, so if you managed to get your hands on one of these, you were lucky! Whats lovely about these cases, is that they are actually practical as well as fashionable. They are made from a soft, flexible silicone that will protect your phone from any knocks and drops! Let me know if you have any of the collection.